The year is almost over. I did my last race a month ago and at the moment I'm making plans for next season. It was a year with successes and setbacks (sometimes I was just unlucky). In the link below, you can read my story of last year. Besides that I would like to say a big thank you to all my sponsors. They make me do and practice my sport in a professional way. Thanks to: Sabic, Isaac, Xendurance, SLS3, Sailfish, Schwalbe, Ron for run, Born, TAO, Fizik, Suunto and C-bear. A week ago I woke up out of my winter sleep and started slowly the training for next season. I have to get used to it after doing almost nothing for 3 weeks. But it gives a very satisfying and good feeling to move your body and try to train yourself to an higher level! The program for next year will follow very soon, and will feature some very exciting races! 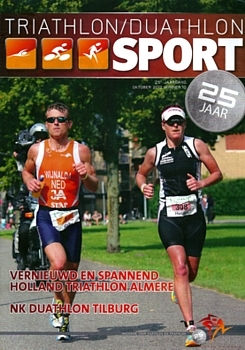 Right: Cover Triathlonsport Oct 2012, photo by Christie Brouwer. Together with Dutch Champion Dirk Wijnalda on the run course in Almere. I did the last race of the season on November the 3rd, IM Florida. Together with Rob we figured out a nice path, so I would be in a good shape. It started after my recovery of Almere, the end of September. The 27th of September I flew with a stop-over in Atlanta to Phoenix in Arizona. Within three weeks I prepared myself at an altitude of 2100 m altitude in Flagstaff. The first week I was al by myself, but then Mirjam Weerd and Heidi Jesberger came to join me. We had a great time together and did some good training sessions. Because of these girls I got the fun in training back (I missed that sometimes this year). It was a pity that I had to leave them on October the 17th. Next stop for me was Groveland, Florida. There I stayed 5 days at the AAT tricamp cetrum of John Hovius. A nice place for training! In that weekend I did the Intermediate Distance race of the Great Floridian Triathlon. This was a 2 km swim, 62 km bike en 15 km run. A perfect distance for a training race: not too long and not too short. We planned the race on the third day after the high altitude camp. And I could feel that! I felt great and strong that day. The result was a third place overall (only two man finished in front of me). Two days after this race I drove to Panama City Beach. Two weeks were left for the final preparation for Ironman Florida. I started to feel a little bit more tired, it could be the high altitude dip or just the training. It was time to taper! I felt better the last week and was really looking forward to race and it seemed to become a very exciting race! Than race day. There were quite some waves in the ocean. I started with a warm up in the water, but I got a little bit scared. Not a good start! At 10 minutes to 7 we were shot away. We started 5 minutes after the male professionals. And again I took the wrong feet. I saw that we were going the wrong direction and I decided to take the initiative. The result was that there were 2 girls in my feet the whole swim leg. According to my feeling, the swim went terrible. But luckily almost everyone had a slower swim then normal, so the differences were about "normal" (not too bad for me). I felt good on the bike. The conditions were perfect, no wind and an almost flat course with only a few corners. So for the first time I rode a time under 4 hours and 50 minutes. When I started the run I still felt ok and my plan was to run a fast marathon. I don't know what was the reason, but I could not find the rythm. I did not have power in the legs and the pace was way too slow. After the bike leg a lot was possible, but then you have to run fast! And I could not do that at that moment. Now I'm very disappointed with the result. But here at home I can't do anything about it anymore. Luckily during the race I could still enjoy it. A few days after the race I'm still thinking about it and don't have a good feeling. No worries, this will disappear over time. At the moment I'm enjoying my 3 weeks of rest after the 2012 season. We will discover a little bit more of France. And then I will make new plans for next year. Get you posted on an exciting 2013 season! What a race! I felt very excited to race, this morning before the start of the National Championships Long Distance Triathlon. It was only 3 weeks ago that I decided to start here because of not finishing in New York. The weather was perfect: no wind, no rain and a mild temperature. It was clear that a very nice day was coming up. 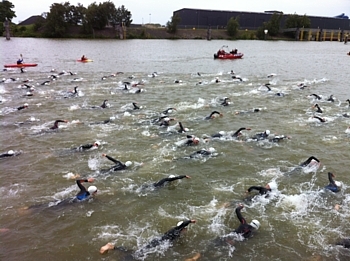 The 3,8 km swim was to be done in 2 laps in a small lake in the centre of Almere. When I came out of the water I had lost 1 minute to my biggest opponent Irene Kinnegim. So I had to bike very hard, also her strongest discipline. But sometimes you have days that the pain in your legs is there from the very first moment you hit the pedals. And this day was one of them. Luckily I had a very good mindset, so I could motivate myself positively all the time. Despite, Irene was another 4 minutes faster on the bike, so I had to make up a gap of 5 minutes on the run. But I didn't give up. We had to run 4 laps and every lap I closed a bit of the gap. At the end of the third lap I was running 20 meters behind her. And then I passed her, luckily the hard work payed off! It was a race where I tested my mental skills in this sport. Of course it helps when there are a lot of people you know supporting you, but still you have to do it yourself. When I look back I have mixed feelings. As an athlete you have to be critical, and I know for myself that it was not a top race. On a good day, another sub-9 would definitely have been possible. But with the result I'm very happy. 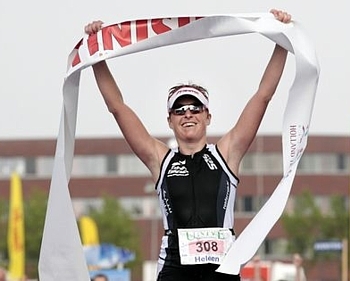 It is my third time that I'm Dutch champion and also my third time that I win an Ironman distance race. 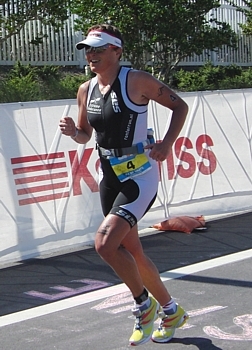 It is 2 weeks ago now that I have dropped out of the New York City Ironman, my last race. As a joke I told a friend of mine that I'm getting a professional in handling setbacks. Not that I'm proud of it, but it certainly is the story of this season so far. After stomach problems in IM Lanzarote, a crash in the triathlon of Stein, this time it was an area on my right foot where too much pressure in my cycling shoe resulted in a cramped tendon. The tendon was so hard that it was impossible to run or walk normally. This was the end of the race for me. It was a pitty, because I was well prepared for this hilly run course! The race itself went very well. I had a very good swim in the downstream river, the Hudson. During the bike part I managed to go from 15th placed woman to 6th. During the bike I felt already some pressure under my foot, but that happens more often, so I did not worry. But when I came off the bike I directly felt that it was not good. I tried running for 3 km, but it got worse and worse. So after a lot of thinking and again trying I decided to quit the race. 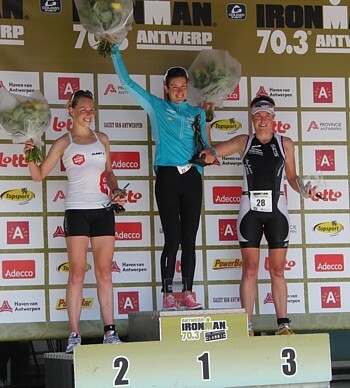 Antwerp was for me the first race of the season where everything went according plan. I had heard a lot about the 70.3 race in Antwerp and I saw the race different times on television. I had in mind that it was a very boring race (I never raced here before so I could not know), but the contrary is true. It is a fantastic race with a lot of supporters and a great audience. On the start list was one unbeatable woman, Nicola Spirig. She is a real contender for an Olympic medal and that is too much for me :-). So the goal for this race was to finish on the podium. To achieve that I had to race as fast as possible. A fast swim, meant for me exciting the water as last. When I jumped on to my bike the road was all for myself. We started the bike part with riding through a long tunnel, the "Waaslandtunnel". Normally it is not allowed to ride your bike here, so it was really cool to ride there all by myself. When there is nobody in front of you it is important to stay focused. For me this meant: push, push and push on the pedals. At a certain moment I arrived at the local loop, which we had to ride 3 times. I started to overtake several women. I came back in transition 2 as the fourth woman. But the two in front of me had to run a penalty loop, so I started the run in second place. I didn't have the real speed for the run so Susie Hignett overtook me after 7 km. The result was a nice third spot on an half Ironman. A good training for Ironman New York within 3 weeks. Now a few days recovery and then I start my last training block. 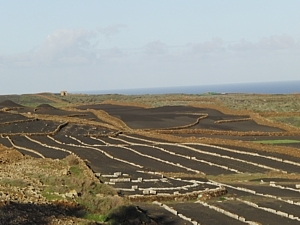 In the past I did the combination Lanzarote-Stein two times. And so far it was not a succes. So this the time the focus was even more on recovery and only when possible I did some quality sessions for Stein. Two weeks before the race we went to Stein to ride and run the course, so I was well prepared. I felt really good and was ready to race. The weather forecast was not very good, but you never know. So the first day of my 38th year of life I was standing in the harbour of Stein, ready for a kind of home race (although I don't live here anymore it still feels a little like that). The swim went very well and when I started the bike part I soon catched up some time. After a few kilometers of cycling it started raining and it wouldn't stop for the whole race. The bike part consisted of 4 loops. After one and a half loop I was already leading the race and still feeling very strong on the bike. But 10 km's later: BOOM! I was riding behind two other triathletes on a small downhill section towards a bridge. I was only looking at the other athletes because they were braking a lot and I was not lookin g at the road. I rode in a hole in the road and collapsed. I was ok, but my bike was not. My derailleur was broken and my rear-wheal totally blocked, so I could not race anymore. This was not what I had expected. The race was over! I had to wait for 15 minutes and was getting really cold. Then there came a photographer who brought me back to Stein. Thanks to him. There a took a nice warm shower and went to the medical to take care of my wounds. The first days after the crash I was a little bit stiff, but soon I could train again. The next day I went to my sponsor Isaac who repaired my bike. Now the Muon TT is ready to race again. 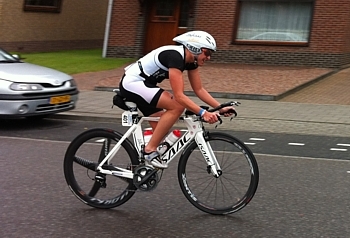 My next planned races are the IM70.3 Antwerp in two weeks and IM New York in five weeks. We are just back from Roth where I had a very good trainingsweek. It's a nice course and I know I'm well prepared for next year :-). You are never to old to learn. Even in my 20th Ironman finish I had to learn something. And in this case it took me of the win, I think. A small report of the most beautiful and challenging Ironman in the world. In the weeks before the race I felt that I became stronger and fitter. I was eager to race and mentally I was ready for a very though day in the office. A week before the race we arrived on Lanzarote. Still some time to get used to the heat and wind. It was the first time that I started together with 1600 other athletes here on Lanzarote. The result was that I ended up in a real washing machine. I got smashed everywhere and it was a real battle to survive. But luckily I did and the real race started. On the bike, the feeling from the beginning was really good and I was flying. Thanks of course to my fast bike the Isaac Muon TT. I was focussing all the time and getting my nutrition in as planned. But from here it went wrong. The energy drink from the organization was according to me too much diluted. That meant the energy I had to take in during the bike part was not enough. Besides that, because it was too much diluted the uptake into the blood was too slow. During the bike part I didn’t notice this. I started my run 10 minutes behind the number 1. Normally I’m the better runner and it should have been possible to run more than 10 minutes faster. I tried to find my rhythm in the first few kilometres. But after 5 km, my stomach started to protest. The liquid stayed in my stomach and I heard it with every step. A few times I stopped to try to throw up, but I could not. It was an awful marathon. But now I’m glad that I finished and it is another top 3 finish in an Ironman. I'm really sure I can show much better than this, and I definitely will do so later this season. After the training camp on Lanzarote in the beginning of March, I have done a French sprint duathlon race in Meaux, near Paris, where I ranked second. This showed some progress, but also that I still had work to do. Then I continued my preparation on the big goal of the first half of the season, IM Lanzarote, with a training camp on Fuerteventura. 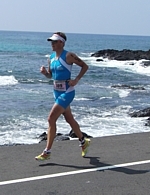 This I combined with racing the Half Challenge on this Canarian island. This meant that I went there two weeks before the race, raced and finally did three days with a lot of cycling. I think it was a very good camp, although the result of the race does tell something else. With an eight spot, 20 minutes behind the number one it seems as if I’m far from there. During the race I felt like racing on Ironman pace and I was not able to give more gas. Probably the first mega trainingweek on Fuerteventura is part of the reason (and because I’m a diesel J). But anyway the feeling was good and I know that my endurance is very good. My recuperation went very well (probably because I didn’t give it all), so I did an “overreaching” block at the end of this camp, part of it being 450 cycling kilometres in three days. With a wind blowing at five beaufort the third day it was mentally very hard. I was glad that I was able to do a small brick run at the end of the day and pack my bike again. At this moment I’m sitting at the airport going home. Next few days I will let my body recover very well so I’m ready for some specific training at home. In four weeks I’m ready for IM Lanzarote. I’m looking forward to race there! It’s already March and the first races have already been taken place. The off-season has finally come to an end. The balance at the moment: 250 swim kilometres, 2500 bike kilometres and 600 run kilometres. But for me the real race season has still to come. At the moment I’m working on a strong basis for hopefully a succesfull season. I have set myself a few very nice goals. 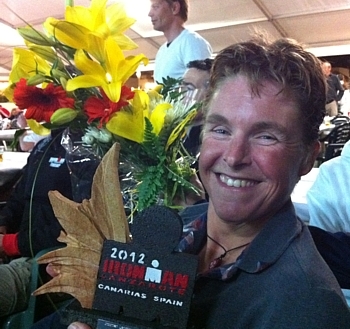 The first “big goal” is the Ironman of Lanzarote. That’s the reason why I’m at the moment on training camp on this very rough island. I try to learn every very small part of this course and island, even if it is already the 11th time I’m here. It’s phenomenal with the beautiful nature and sometimes incredible wind. I love it and hope that May 19th will make this journey with a very happy end. First of all a very happy and healthy new year to all of you! 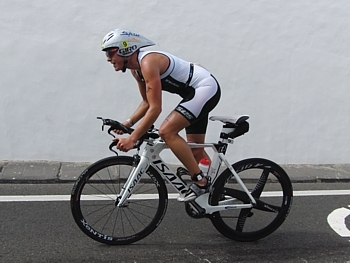 A new triathlon season is starting soon, so I went to Lanzarote for my first trainingcamp in December ever. Together with a nice group of Dutch triathletes we enjoyed ourselves and last but not least rode quite some kilometers. When I came back, it was off to a small island in the North of The Netherlands (Ameland) for a long weekend celebration with Robs family. Coincidentally they organized a half marathon race on the island that weekend as well, so I did some beachrunning in cold windy weather with my tired cycling legs! Then we drove back to France, to board a plain to another Spanish Canary Island a few days later. Tenerife this time, and again for a family celebration, with my parents and the families of my sisters. But Rob and I couldn't resist to bring our bikes and wetsuits, so there we went almost every day for some extra training hours. Perfect, but also a bit weird to run around in shorts around Christmas. Now I'm back home for a week, before flying to South-Africa this Sunday for my first race of the 2012 season. I will participate in the Ironman 70.3 race in East-London on Sunday the 22nd. The race starts early in the morning at 7am local time, which means 6am Paris-time. © 2005 - 2012 Heleen bij de Vaate & Rob de Hooge. Photographs published on this site may not be used by others without our permission.